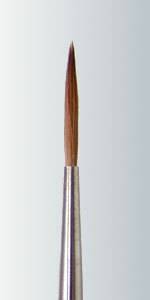 Our Red Sable brushes are made with the finest Red Sable hair available on the market today. They are made to provide excellent performance. They may be used for oils, acrylics, stains, underglazes, watercolors, varnishes, and china paints.